“Sport rarely settles upon the perfect script. Life’s just not like that”.. .. the 2017 IAAF World Championships, the 16th edition is being held from 4 to 13 August 2017 in London, United Kingdom. London was officially awarded the Championships by the International Association of Athletics Federations (IAAF), in Monaco, on 11 November 2011. 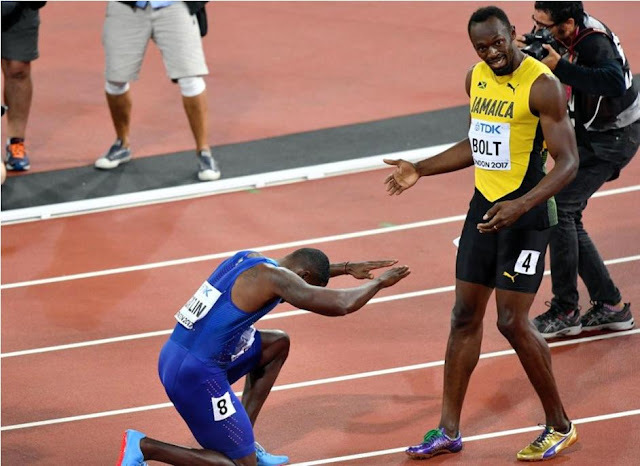 The much talked about event is 100M mens – Usain Bolt, Yohan Blake, Justin Gatlin, Christian coleman, Akani Simbine, Jimmy Vicaut, Reece Prescod, Bingtian Su were on the track as the World waited to see the greatest sprinter of the Universe run his last leg !! Clive Hubert Lloyd was the most fearsome Captain. A great attacking batsman, a great cover fielder, had the best batsman [Roy Fredericks, Gordon Greenidge, Viv Richards, Alvin Kalicharran to name a few]; developed fearsome battery of pacers [Andy Roberts, Michael Holding, Collin Croft, Joel Garner, Malcolm Marshall, Wayne Daniel, Julian … ] – his team was thrashing every other team – tour to WI was most dreaded, visiting players would have their limbs broken, matches lost, players losing career ~ but at Sydney in Dec 1984, little known Bob Holland and Murray Bennet handed over a sound innings defeat in his last test. Months later he was to play his last One dayer ~ this time against Pakistan at Melbourne in Victoria Cup – Clive Lloyd was out to Mudassar Nazar whose 5 for 28 bundled WI for a paltry 159 which was chased easily, ending Lloyd’s career on a low !! At London, the great Jamaican Usain Bolt is set to retire after the IAAF World Championships, bringing the curtain down on an incomparable career. A disappointment for millions of his fans as on Saturday he had to settle for bronze as the American Justin Gatlin secured a surprise victory in a season's best 9.92 seconds. Fellow American Christian Coleman (9.94) took silver, with eight-time Olympic champion Bolt, still the reigning 100m and 200m world record holder, in bronze, clocking 9.95 seconds. Gatlin entered London's Olympic Stadium with the crowd's boos ringing in his ears. The 35-year-old is regarded by many as the sport's villain after twice being banned for doping offenses. He was also jeered in the heats and semifinals. There was no animosity down there on the track, but a Gatlin win, at 35, was an embarrassment to athletics, where there was a rash of drugs scandals after the 2012 London Olympics in this very stadium. Gatlin is by no means the only top athlete who has been given a second or third chance after pharmaceutical cheating, but his transgressions stand out in sprinting, which has led the way in conning the public. Questions abound. Gatlin is the oldest world 100m champion, so did previous drug use help him to go on this long? Is he still benefitting now? Gatlin claimed not to be bothered by the boos of the London crowd. "I tuned it out through the rounds and stayed the course,” he said. Sunday night’s world championships 100m medal ceremony was switched because athletics chiefs did not want to see a full stadium booing Justin Gatlin and the American national anthem. The ceremony was originally due to be held at 8pm but was moved to 6.50pm before the evening programme started. The International Association of Athletics Federations has officially insisted that the switch has “nothing to do with the result”, however their denials were met with scepticism by most observers inside the London Stadium. Meanwhile Sebastian Coe, the president of the International Association of Athletics Federations, says he will congratulate the new world 100m champion Justin Gatlin if he sees him in London this week – but admits he was far from “eulogistic” to see the twice-banned American sprinter win gold. “Sport rarely settles upon the perfect script. Life’s just not like that,” Lord Coesaid. So Sun sets on Usain Bolt .. !! Adieu to the great sprinter !! !